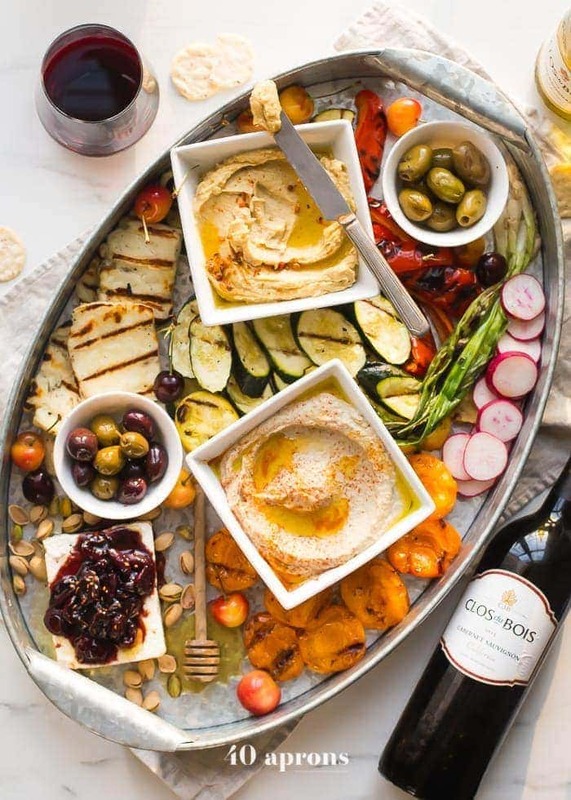 This healthy Greek appetizer platter is perfect for summer entertaining, loaded with healthy make-ahead appetizers you can customize to your own tastes. My healthy Greek appetizer platter includes Mediterranean dips and spreads, grilled veggies, fruits, and halloumi, fresh fruit, nuts, and feta topped with a rich, fruity reduction. If you're doing some summer entertaining soon, this healthy Greek appetizer platter is just the thing you need! Combine cherries, balsamic vinegar, vanilla bean seeds, honey, olive oil, and water in a small saucepan over medium-high heat. Bring to boil. Reduce heat to medium/medium-low. Simmer until mixture is thick and reduced by more than half. Remove from heat and let cool slightly, then pour onto feta. Serve with crackers and more honey, if desired. Prepare a hot grill. Drizzle all vegetables and halloumi with a bit of olive oil then season with salt and pepper. Brush grill grate with a little olive oil to prevent sticking. Grill vegetables until tender and nicely charred, turning occasionally. Green onions will be ready after 2-4 minutes. Peppers and zucchini take about 10 minutes. Transfer from grill to serving platter. Grill halloumi, about 2-3 minutes on each side until grill marks appear. If you press gently on the cheese, it should be tender and give a little but not be too soft or runny. Transfer from grill to serving platter. Sprinkle grilled vegetables and halloumi with fresh mint, if desired, to serve. Drizzle halloumi with harissa oil, if desired, to serve. You can grill the apricots at the same time as the halloumi to ensure things come out at the right time. Prepare a hot grill (or keep grill hot from grilled vegetables). In a medium bowl, combine apricots, olive oil, honey, vanilla bean seeds, and salt. Toss to coat apricots well, ensuring vanilla bean seeds are evenly distributed. Grill apricots, cut side down, until marked and beginning to soften, about 1 minute or so. Flip and cook about 30 more seconds on the skin side until marked. Transfer to serving platter. Arrange all items on a platter, evenly distributing types of dishes (dips, fruits, nuts, cheeses) and colors, making sure no type of dish or color is too concentrated. You can start by placing large items like dips and arranging dipping items (crackers, grilled veggies, fresh veggies) around them. Serve with plenty of chilled Clos du Bois Chardonnay and room temperature Clos du Bois Cabernet Sauvignon!